If You want Your Private Weather Station(PWS) Davis Vantage Pro2, or other Davis products that use WeatherLink, to provide data for the template we use at Domstens Båtklubb just follow the instructions below. 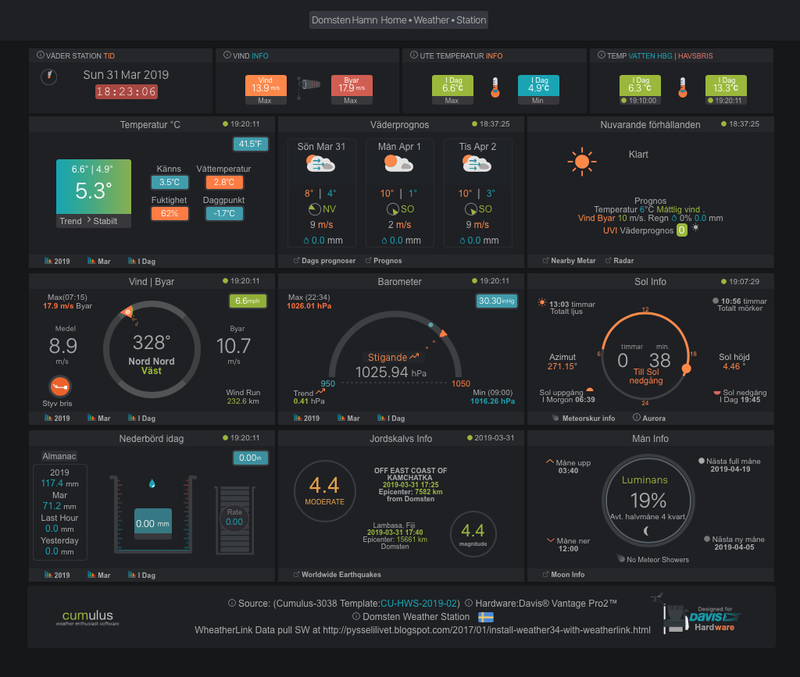 This is made without additional software such as Cumulus, Weather display or the Meteobridge product. 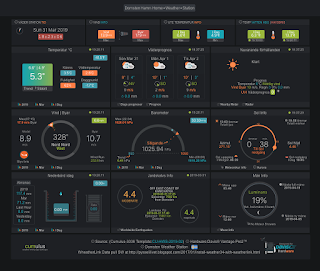 An example of a WeatherLink dashboard with Node-Red is found here. Install W34 according to the instructions, WEB hosted installation, on a Mac or Raspberry Pi(RPi) install below. Please note that the service for old WU API have terminated but the W34 application, to get historic data, is using a standard HTML request without a KEY which is not affected. If You are supplying WU with Your PWS data You will get a API key for the new API without cost. You can then get a 5 days forecast which is supported with the W34 version issued 2019-03-31. To start up fresh on the RPi You can follow the instructions here where You install Apache2 and PHP 7.2 on Raspbian Stretch. The Cumulus version of W34 is now, 2019-01-07, supported by the Cumulus team. There is a Wiki, a Forum, a GitHub repository. For this W34 version, running PHP 7.2, You must have the php7.2-curl and php7.2-mbstring packages installed. Installation is referring to a RPi with hostname "pws01". uses Your credentials to log on to WL. Please note that for the WL2.0 interface the $wlink_user is changed to Device ID from former user. "Your Path to data file" => "add_on/realtime.txt"
This job will get the data, every 5 minutes, from WL and create/update the online file "realtime.txt"
Trend values, temperature and pressure, DarkSky forecast and Last Hour Rain can take up to 2 hours before they are OK.
”settings1.php” file so You don't have to register all settings with "easyweathersetup.php" again. Allways run the "easyweathersetup.php" so a conversion could be done and check if there are new settings. When registering at WL use lowercase for the "User name". New Cumulus version available, dated 2019-01-05. If upgrading and migrating Your old "settings1.php" You must run "Settings" and update the "Temperature module" part and "Sunposition Bearing" otherwise the application don't work. New Cumulus version available, dated 2018-12-14. If upgrading and migrating Your old "settings1.php" You must run "Settings" and update the "Davis Hardware" part and "Sunposition Bearing" otherwise the application don't work. Simplifying the installation and, inspired from Aaron, handling the authority in a better way. "cumulusdata.php" is now updated for WL JSON data, PHP 7.2 and as said above You have to add "Curl" and "mbstring" support. The new version, WL2.0, is migrated in this post. The new version, WL2.0, is discussed in this post. NOTE ! If You are updating to the new W34 version V3.4 X5(e) and migrating ”settings1.php” You have to use "easyweathersetup.php" and update new fields before You start the W34 application. the indoor temp is substituted with this value. To display the info within W34 a changed "homeindoor.php" is available at Github which could be used in the "Top Row 4 Modules"
NOTE ! If You are updating to the new W34 version V3.4 X5 and migrating ”settings1.php” You have to use "easyweathersetup.php" and update new fields before You start the W34 application. In the section "Some Extras....." and the part "These options are.... " choose the default "current34condtions.php"
Due to changes in W34 the program "cumulusdata.php" now calculates trend values for temperature and pressure in a new way and therefore the file "realtime.templ" is extended. So if You are doing an update You must change to the new "realtime.templ" and "realtime.txt". The best way is to delete both files and download the extended "realtime.templ". Then when the program "cumulusdata.php" runs for the first time the "realtime.txt" will be recreated. everything works fine but index.php won't load. It appears common.php is killing it. Ideas? installed mbstrings - all fine tku!